Whenever Custodi Soulcaller attacks, return target creautre card with converted mana cost X or less from your graveyard to the battlefield, where X is the number of players you attacked with a creature this combat. I have made cleric deck my self with Ayli, Eternal Pilgrim as the original commander but generally found Ravos and Tymna better due to card draw. That said there are some recommendations I have found from personal experience with Ayli you may find helpful. I generally found I had two main issues with the deck and it was gaining enough life quickly to bring Ayli online and then having enough bodies to act as fodder for said ability. With that in mind I will try and make suggestions that generally forward those causes. 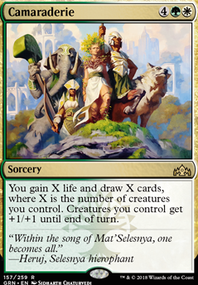 Lifeline, I cant recommend this enough it does EVERYTHING your commander wants, while it may allow for opponents to benefit at first, reaching the magical 50 life exile enabler for your commander is easy then you can start exiling the problems. As an added note you can use things like Fiend Hunter or Containment Priest to keep your opponents from taking advantage of it, just sac Containment Priest in response to the Lifeline triggers to prevent your self from getting hosed. Patriarch's Bidding and Living End are also pretty good recursion. I assume your exclusion of Exquisite Blood with Sanguine Bond in the deck is intentional, if its not I would add it as its a win combo. If you choose to not add in Exquisite Blood then Beacon of Immortality can be quite funny when added to Sanguine Bond. 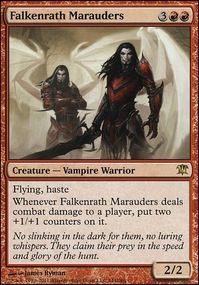 Exsanguinate is an excellent addition alongside the Debt to the Deathless you have in there and will help make it easier to bring your commanders removal online while weakening others. 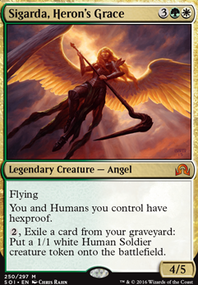 Heliod's Pilgrim with Gift of Immortality is a nice way to fuel your commander and generally helpful. Remorseful Cleric Excellent graveyard removal and in tribe. Conspiracy should be added to go with Rotlung Reanimator as all your creatures become clerics including tokens. This means you can sac tokens to make more tokens, in short its one of the holy grail's your commander wants for sacrificial fodder. Custodi Soulcaller decent aggressive in tribe low cmc reanimation. I would also consider Sun Titan as the reanimation is very useful even if its not in tribe. 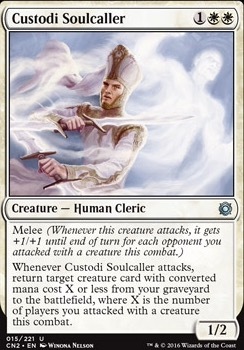 Skirsdag High Priest, sacrifice something make a 5/5 flyer once a turn seems helpful. Evangel of Heliod I have had missed results in the past but it does provide tokens, though including an Elspeth, Sun's Champion is probably a better idea. Also, as you are gaining a lot of life you might consider things such as Greed and Necropotence to synergize with your strategy and get you cards. Hero of Bladehold Inexorable Blob Kessig Cagebreakers! Myr Battlesphere Nacatl War-Pride! Reveille Squad! Expedition Map : not really convinced by paying 3 for a land, except for a Darksteel citadel to awaken... but if i add Niykths, it could be a good idea. Mirran Crusader : yes, if i had this card, it would be a good addition. Custodi Soulcaller : i don't think it would be good here : i play in duel, melee isn't a keyword Odric can share, and i have to few low converted mana cost creatures to use the soulcaller ability. Nykthos, Shrine to Nyx and Expedition Map is the best ramp mono white has. 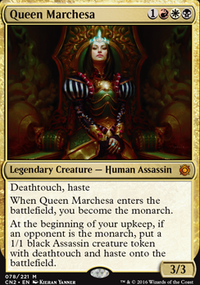 Also Mirran Crusader, Custodi Soulcaller, & Council's Judgment seem good here. Some of these are not staples but I just like them.